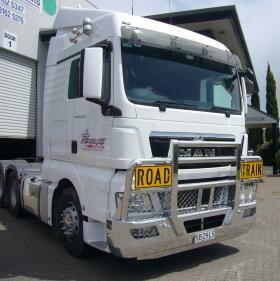 MAN TGS Road Train Fups Aluminium Bullbar, four post box uprights with heavy duty high tensile one piece aluminium main cross pipe, no but welds. Heavy duty mesh in front of grill and lights for maximum protection. Light bar brackets to customer specification. Heavy duty backing plate with tow hitch. Provision for lower mudflaps. Aluminium reversible Road Train signs. Combination indicator/daylight running lights recessed mounted in outer box uprights. 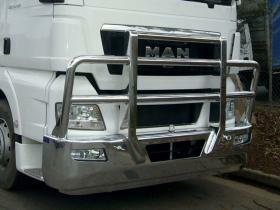 MAN polished aluminium hi-tensile bull bar with high uprights, FUPS compliant. Contoured bent 76mm diameter pipe. Heavy duty steel backing plate with tow pin. 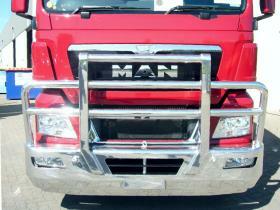 MAN low profile hi-tensile aluminium bull bar for TGS with security door mesh that minimises damage to body. Heavy duty steel backing plate with tow pin. Low profile allows front cab panel to open to allow for daily checks. Provision in centre of main channel for unrestricted air flow to radiator. Mountings fitted for Road Train &Long Vehicle signs. 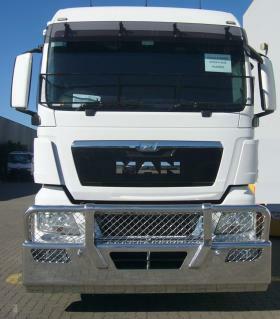 MAN TGL FUPS bull bar with box uprights and grill over headlights that prevents breakage of headlights. One piece 76mm heavy wall cross pipes through drilled uprights for maximum strength. Heavy duty steel backing plate with tow pin. 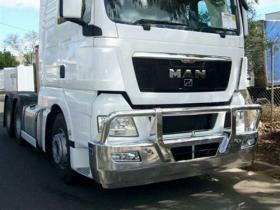 MAN TGX hi-tensile aluminium FUPS approved Road Train bullbar. Box centre uprights with curved 6mm wall hi-tensile tube outer uprights with additional support to main bar. 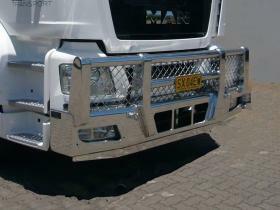 Heavy duty mesh inserts giving maximum cab protection from birds, roos etc. plus two extra centre uprights on the lower part of the bar. Reversible Road Train signs on alumium plate. Custom shaped main bar to compliment the truck lines. Heavy duty chassis mounting plate with heavy duty tow pin. Driving light mounts to outer top bar. 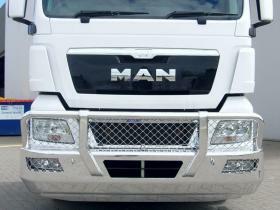 MAN TGX & TGS low profile hi-tensile aluminium polished bull bar to allow access to front flap to be opened for checking oil & water. This picture shows latest style with two extra centre pipes for grill protection. Heavy duty steel backing plate and tow pin. MAN Non FUPS hi-tensile aluminium bull bar with FUPS device fitted below. Suit 4 wheel drive MAN. 76mm tube. Heavy duty steel backing plate with tow pin. TGS early model with slightly higher middle uprights. 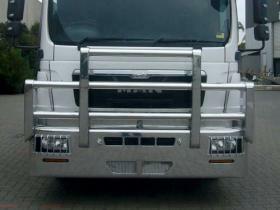 MAN TGX custom built polished aluminium bull bar with high uprights, FUPS compliant. Heavy duty steel backing plate with tow pin. 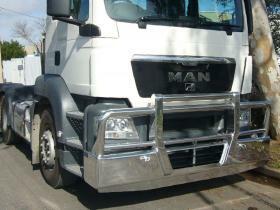 MAN low profile hi-tensile aluminium bull bar for TGX with security door mesh that minimises damage to body. Heavy duty steel backing plate with tow pin. Low profile allows front cab panel to open to allow for daily checks. 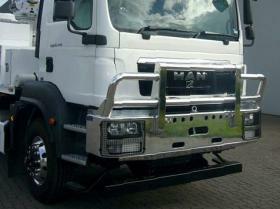 MAN TGX low profile hi-tensile polished aluminium bullbar, heavy duty steel backing plate with tow pin. Low profile allows front cab panel to open to allow for daily checks. MAN TGX low profile hi-tensile polished aluminium bullbar with 76mm heavy wall tube and extended depth main channel with lower skirt, heavy duty steel backing plate with tow pin fitted with heavy duty mesh for added protection. Low profile allows front cab panel to open to allow for daily checks.